In honor of the recent passing of Elizabeth Taylor, Turner Classic Movies had a marathon if you will of her movies this past Saturday. Being as how Liz is one of my favorite actresses, you can imagine my delight upon discovering this. During this homage, I learned something. 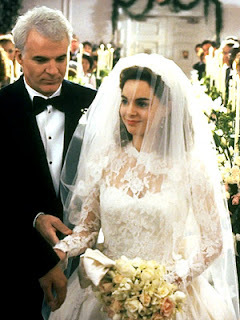 Father of the Bride wasn't an original production, nor was Father of the Bride 2. I watched this version from 1950 directed by Vincent Minnelli. 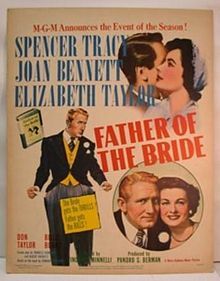 It stars Spencer Tracy as the father who's prone to flying off the handle, Joan Bennet as the indulgent mother, Elizabeth Taylor as the bride-to-be and Don Taylor as the groom. After watching this classic, I realized that the only thing that was original in the 1991 adaptation was the addition of Franck, and to be perfectly honest his character's absence in the original wasn't missed at all. In fact, it wasn't needed. See! Even their dresses are similar! When compared to Spencer Tracy, Steve Martin's portrayal of the father figure is, what's the word? Oh yeah, crazy. He's irrational and prone to crazy antics, whereas Spencer Tracy is practical and reacts the way I feel most fathers do/would. But I probably should admit that Spencer Tracy is another one of my favorites and in my eyes not many actors can hold a candle to his performances. 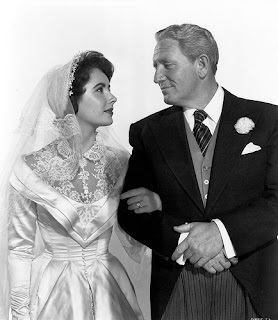 So, even if black-and-white flicks aren't your thing, I highly recommend you watch the original version of Father of the Bride. If you like Steve Martin's version, the original is better. I noticed that they were running that Liz Taylor marathon and I watched parts of Cat on a Hot Tin Roof and BUtterfield 8. Your review of Father of the Bride is excellent, Ashton. In our modern world where everything is supposedly "new and improved" it's refreshing when someone your age picks the older black and white picture as the better one. Indeed, it takes some arm twisting to get most young people to watch anything in black and white. That's a shame because they're missing many fine works such as the film noir classics of the 40s and 50s. Some reissue studios are colorizing black and white movies but in most cases the process diminishes their quality and violates the director's original intent. Spencer Tracy always played a rock solid authority figure and his acting style was so natural that his characters seemed totally real. If you haven't already seen them I urge you to rent It's a Mad Mad Mad Mad World and Guess Who's Coming to Dinner. I hope all is well with you, dear friend Ashton!